Bedrock Radio is a registered charity (1180476) run entirely by local volunteers who give their time generously to run our Community Health & Hospital Radio service for people and health services in Havering, Barking & Dagenham and Redbridge. We receive no financial support from the Government or the NHS. Bedrock Radio is funded by donations from the general public and local companies, we achieve this by hosting local events, or arranging collections in the local area. Why donate to Bedrock Radio? We are a Community Health & Hospital Radio Broadcaster. Broadcasting to patients of Queen’s, King George & Goodmayes Hospitals. We aim to make patients stay in hospital better, by broadcasting dedicated hospital focused radio programmes and visiting patients on the wards. We receive no income from the Government or NHS - We are totally independent & self funding through donations & sponsorship. We are run entirely by a team of volunteers, who give their time generously to visit patients & produce shows and raise awareness. You’re supporting a small independent local charity. None of our volunteers are paid, so you are not lining some CEOs or department heads pockets. The funds raised from your support enables us to keep on-air, entertaining patients across our local hospitals, plus continue outreaching to our community about benefits of a healthy lifestyle. You will be supporting our volunteers who are from the local community, helping boost their communication skills and making them feel part of a fantastic team boosting their social confidence. 2x Sponsor Credit (20 seconds) Per hour of show. 1x Credit featured show promo (Played through the week) Logo + Link included on website. 1x sponsor credit played on-air 10x a day. Plus sponsor credit played in-app. We arrange and host a number of events, we are always looking for commercials partners to help support our events. and we can help by promoting your product! Your business could be a voting member of our charity! Put the FUN into Fundraising by organising your own fundraising activities on behalf of us. Sell some fabulous fairy cakes, beautiful brownies or get creative with the carrot cake. Get some naught or nice treats and make a donation to Bedrock Radio. Have our volunteers come down with our collection buckets to collect & interact with your customers for a day. We can even provide some background music for the day! Take a walk with Bedrock Bear – ideal for a sunny day! Raise funds by selling tickets for the day, or perhaps an office sweepstake to boost your donation! Pick Bedrock Radio as your chosen charity. Our team would love to work with you! Hospital patients & staff, care homes, the wider local community. Hospital broadcasting is unique, we get heard by many people due to high patient turnover. 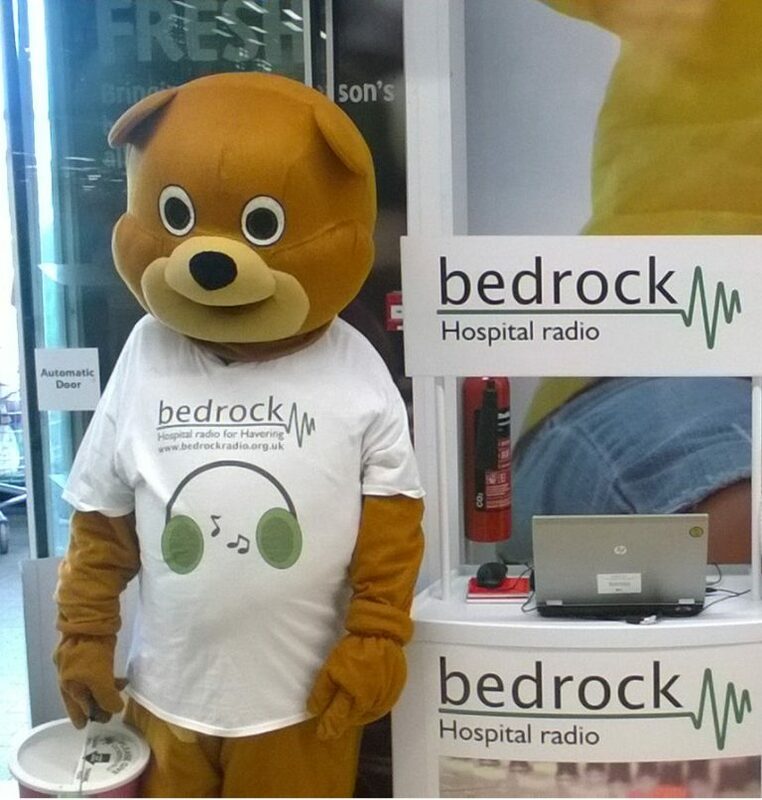 Bedrock volunteers visit the wards regularly to encourage patents & staff to request songs.